Campaign for a Commercial Free Childhoood (CCFC) is encouraging its members to celebrate the difference their collective voices have made in the lagging sales of Mattel’s new Hello Barbie doll. 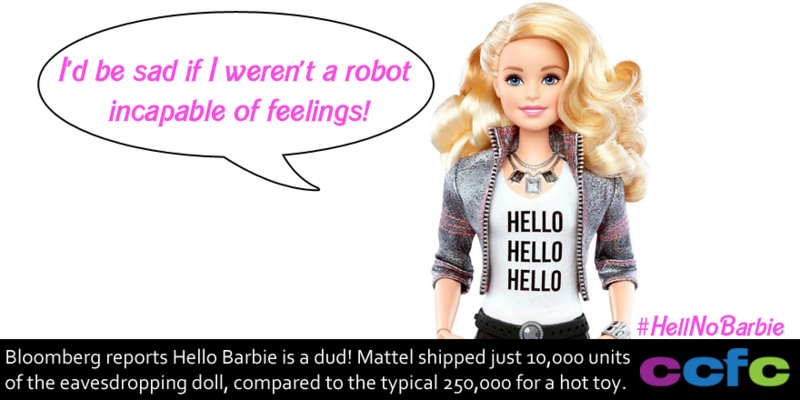 Nearly 45,000 people signed CCFC’s petitions urging Mattel not to release the doll that records and analyzes children’s conversations. See CCFC’s article for more information Hell No Barbie: 8 Reasons to Leave Hello Barbie on the Shelf. Coinciding with this is a report from Bloomberg News that sales of Barbie are extremely weak. Next postWhat does media mean to you?